JungleDocs supports a number of built-in workflow actions that will help you automate your document creation. Note: if you haven't enabled JungleDocs workflow actions yet, you can find out here how to do this first. Once you have selected “Convert Document” action from the drop-down workflow menu, you will be given the following options. Document item – which document to convert. You can choose a document (see picture below for instructions) by specifying a parameter or use the current item on which workflow had been started. Specified document format – document format to convert it to. Supported conversion formats are .pdf and .xps (see picture below). URL – URL of the new document. You can use output parameters later in other actions. For example, when updating the item property of a converted document or when sending an email to users with the converted document URL attached. The document library where documents are located. This shows which document to choose, according to the specified values. In this example, the document chosen for conversion must contain „Proposal“ in its Title. 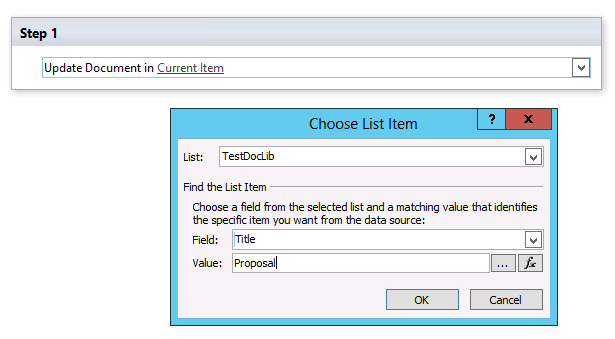 If multiple documents with the title „Proposal“ are present in the library, only the first one will be converted. You will also need to choose the conversion format. Possible conversion formats are .pdf and .xps. With JungleDocs it is easy to update document properties by executing JungleDocs rules through Workflow actions. Document item – document to update. You can choose a document by specifying parameters or by using a current item on which the workflow was started (see example below). You can use workflows to create new documents from existing SharePoint items by executing JungleDocs rules. This action can only use list items that were used to trigger a workflow in the list where the item is located. This activity cannot use items from another list. You can use workflows to create reports by executing JungleDocs rules. It is easy. View name – Name of the view, which contains items that need to be exported (for example – All Items, Companies and etc. ).